Is NASA or someone at NASA bonkers? I was just going over my news stuff on Yahoo and from the NASA Earth Observatory box I saw an item titled “Arctic Sea Ice Melting and Moving” that was noted as put up 7 hours ago (it’s 6:03PM in New York right now). I found the premise interesting, especially since it’s getting to be winter in the Arctic and the sea ice is building again. Clicking upon the link I went directly to this page at NASA Earth Observatory. (I took a screen shot for posterity in case it “inconveniently” disappears at a later date – if so, put a comment up and I’ll put the screenshot up. Nice pictures eh? The same ones are at the top of my post. Their post is dated today (November 10, 2010), so it’s not an old article. If you look underneath each photo there are dates. Note the year on those photos. RADARSAT mosaic April 2008, April 30, 2008 and November 30, 2008. Now, I don’t know about you but I have to question why NASA would publish what I consider to be an alarmist article about the melting sea ice in the Arctic that’s based upon data from 2008? Is it funding time? Are they worried about what’s going to happen with the Republicans taking over the House of Representatives and feel the need to (pardon the pun) turn the heat up? Or, is it merely that someone at NASA is trying to pull the wool over everyone’s eyes? As you can see from the below chart the sea ice really is building already, it’s not melting. Moreover, it’s slightly above 2009 and also above 2007 which is a good sign it could be building back up from the 2007 low. Perhaps a mistake? Well, at least they didn’t include a touchy-feely photo of mama polar bear and her cubs supposedly stranded on a small iceberg. Seems like more CO2 insanity to me. Comments Off on Is NASA Bonkers? Science Idiot of the Month? You have to just love this one! Here we have a review of “Sea-level is the best way to predict impacts of climate change: Australian scientist” that about caused me to fall out of my chair laughing. In the book Understanding Sea-level Rise and Variability, released on Sunday, Australia’s Commonwealth Scientific and Industrial Research Organization (CSIRO) oceanographer John Church said the best way to predict the impacts of climate change is to look at the sea. “The oceans are absolutely central to climate change,” Church told Australia Associated Press on Sunday. 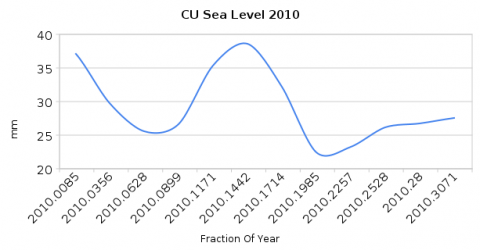 Taking this on the face of it as being accurate I submit the below graph showing the sea-level. Ice sheets? Did he say ice sheets? 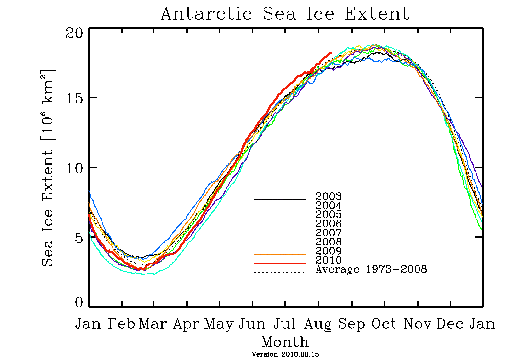 OK, here’s another chart below regarding Arctic ice. Another oops! Seems like we have more sea-ice, too! Assuming his theory is valid, then I feel I can safely assume we don’t have any global warming going on. I have to really wonder who in their right mind would buy this book? Comments Off on Science Idiot of the Month? 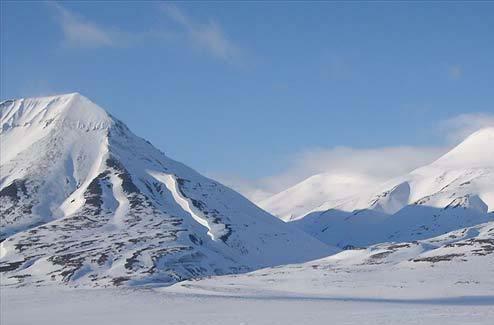 We now have the quickest freeze – ever – in the Arctic, right now, as I type it’s freezing faster than ever recorded. 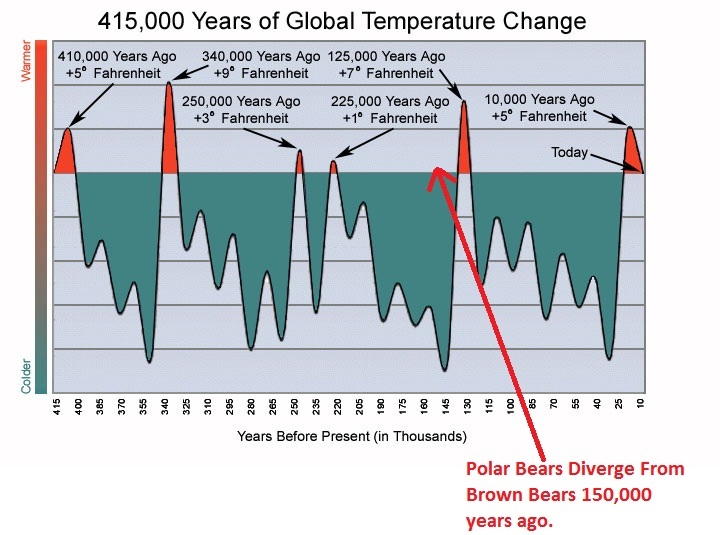 According to Steven Goddard’s Real Science blog…..
It”s official. 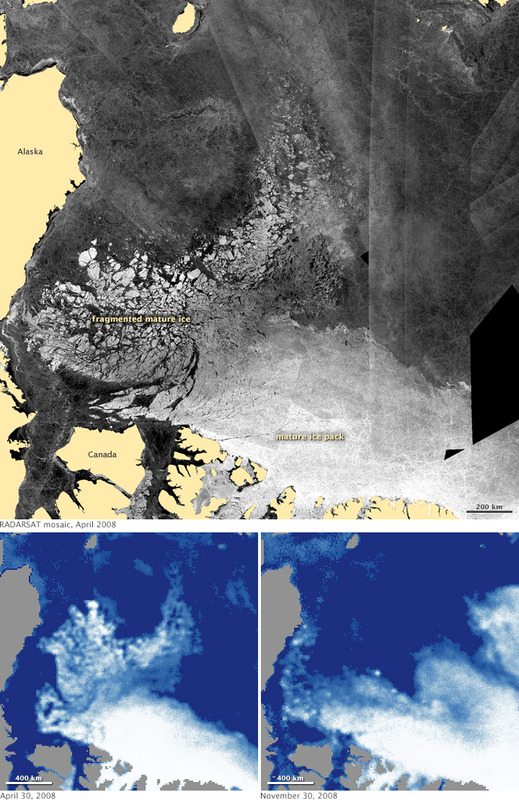 From September 20-30, JAXA gained 661,250 km² of ice. That is more than 11,000 Manhattans, and is the fastest start to winter in the JAXA database. Can you warmers say oops? While things can change it certainly seems to me that we’re off to a better start than ever before and it’s only the beginning of October. You can refer to an item I posted on 8/15/2010 titled “The Arctic Is Not Melting” and another post on 9/21/2010 titled “Contrary to Warmer BS Arctic Ice Thickening” if you want to read what I think about the climate alarmist cries that the Arctic is melting away and we’ll soon be sailing thought the Northwest Passage on a regular basis. But, lest I crow too loud and offend any warmistas or come up with any conspiracy theories, perhaps it’s just due to mere degradation of satellite data or sensor failure, or perhaps just some well paid scientists working for a billion dollar government agency are asleep at the wheel and it’s merely a simple mistake of unchecked data and we should all ignore it and it will go away any day now. Yes you read right. 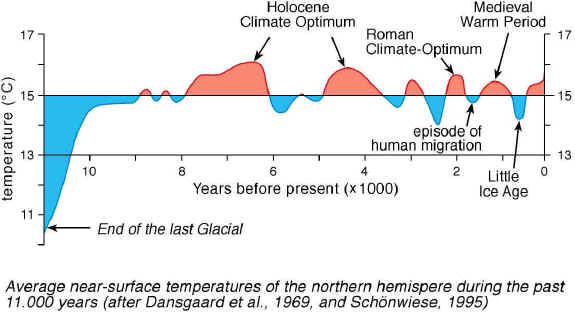 To all those who want to believe all the warmer propaganda like “the ice is melting” or “soon there will be no ice in the Arctic” and other cute little phrases designed to scare those global warming bucks right out of your wallet into someone else’s bank account please go look at this one from Real Science. As you can plainly see the ice is getting thicker, not thinning faster than Kojak’s hair. Polar Bears will not be drowning, the Walruses will not be beaching themselves due to lack of ice (which by the way is normal and not something to get over-excited about) and the Arctic Fox probably doesn’t need to go on the endangered species list because of that old faux global warming. All you warmers please take a deep breath and say oops! Please go to the source below for all the information. The “warmers’ are such an amazing propaganda machine. Joseph Goebbels, the king of Nazi propaganda, surely would feel like a proud papa were he to return from his well deserved visit to Hell. At least the “warmers” haven’t sent us “skeptics” to concentration camps, yet. Though I’d wager some would love to. Words like honesty, truth, accuracy, and reality are apparently not in their vocabulary. People such as Adolf Hitler, Vladimir Lenin and William James (father of modern psychology) have all made statements to the effect of “tell a lie often enough and people will believe it, ” which kind of sounds like the “warmer” mantra. Speaking of Hell, the “warmers” want you to think it’s hotter than Hell in the Arctic this year. But is it? Or, is this just another case of mass propaganda put out by the “warmers” to be foisted upon the public by a mainstream media who are either clueless, in cahoots with them, or both. 612 degree temperatures in Egg Harbor, Wisconsin. Satellite-gate about how the Landsat 7 satellite doesn’t work all that well, and how new, yet to be launched satellites, will be missing a lot of sensors they should have aboard. Satellite-gate 10-15 About how the NOAA data is 10-15 degrees high due to satellite data being incorrect. We have some wacky people and government agencies providing some very wacky data, that, as evidenced by the deletion of satellite sensor arrays from those new satellites, leads me to surmise that something is rotten. I did find some more information which leads me to the conclusion that the data they use is perpetuating a fraud upon the general public. Many “eat” the “alarmist” newspaper articles, TV shows and “alarmist” website BS up like candy. Remember, newspapers are a hurting industry, they’re in business to sell papers and they need sensationalism to sell papers. You can say the same about TV and internet. An article titled “No problem in the Arctic – Plenty of Sea-Ice – No global warming – you can relax now” isn’t going to sell many papers. An article titled “Sea-Ice Melting! No Arctic Ice by 2030! We’re all gonna die!” will certainly get the general public’s attention. Toss in some Photoshopped pictures of polar bears sitting on mini-icebergs, and the “alarmist” BS about the iceberg that just broke off a glacier in Greenland (here), and you’re going to sell lots of news. This morning I found an article at Pajamas Media about how NOAA and GISS are obtaining their alleged Arctic temperatures. They then use this faux data to make claims that it’s really hot up there, the ice is melting, the polar bears are dying, and you’ll be able to sail the Queen Mary though the new Northwest Passage in a couple of decades because due to global warming the polar cap will melt. Below is one snippet. In the case of the Arctic that one thermometer and the few that are on the fringe of the Arctic are used to calculate the average temperature of everything north of eighty degrees. When one uses a 250-degree smoothing factor for the data from GISS, the truth is suddenly and shockingly revealed: they don’t have any thermometers north of eighty degrees and very few north of sixty degrees. The 1,200 kilometer smoothing floods the Arctic with assumed temperature readings that don’t actually exist. So what does this all mean in miles? To get into further detail than the PJ article, each degree of latitude is approximately 69 miles. From 80 degrees north, where their highest (if I read the article right theres’ only 1)sensor is, it is about 690 miles to the North Pole (90 degrees north), (10 degrees x 69 miles = 690 miles). For an equivalent it’s like having a sensor in Salt Lake City, Utah and claiming the temperature there is the temperature in San Francisco, California. You can see approximate degrees latitude and approximate distances on the below map. From 60 degrees north, the line where most sensors cease to exist, it’s approximately 2,070 miles (30 degrees x 69 miles =2,070 miles). That’s like having a sensor in San Francisco, California and using it to ascertain the temperature in St. Louis, Missouri. Again, an extremely long distance to be claiming one temperature is the same as the other. As en example, using their method, I could create a chart now showing that it’s 99 degrees in San Francisco when it’s really 43 degrees cooler because I’m using that 1200 km “smoothing” that allows me to effectively cheat and claim the temperatures are the same in both cities, regardless how preposterous the claim is. This is one way you get all the claimed global warming. Toss in that satellite data that is 10-15 degrees higher and you have voilà, the “hottest June,” “the hottest 6 months,” “the hottest year,” Hopefully you get the point that it’s tantamount to a lot of “hot air” and as far as reality is concerned, it’s not much scientific value, unless you’re into science fiction stories. Now let’s get to the sea-ice extent in the Arctic and what’s really happening at the north and south poles vs. what the “warmers” would like you to believe. As far as the “warmers” are concerned that Arctic sea-ice is melting at record rates. It’s yet more proof of global warming and designed to foster the false belief that we’ll soon all think we’re roasting in Hell with Joseph Goebbels, unless we start worshipping at the Church of Global Warming and put lots of money in that basket when it’s passed around. What I call “Alarmism” at its best. The website Watts Up with That has a nice sea-ice page with all the latest charts on what the sea-ice extent is doing. They’re regularly updated, too, which is good because you’re not looking at old or faux data, it’s right from the source in real-time. 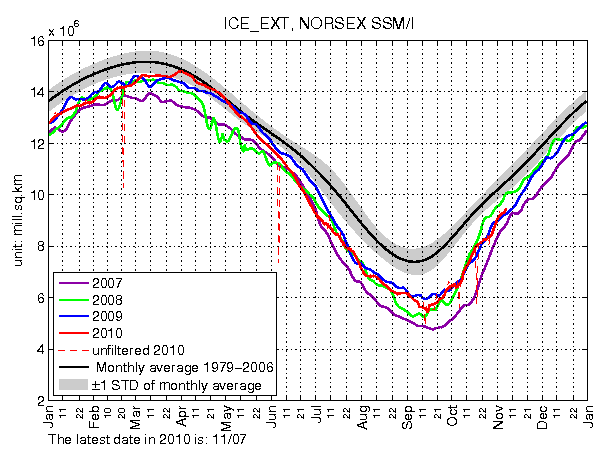 Per his “Sea Ice News 18” summer is over in the Arctic. 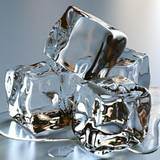 The ice shouldn’t be melting anymore, it should start building now that it’s getting colder. Per the chart below you can see for yourself that the temperature has peaked and is now dropping. Per the next chart below, you can plainly see (the red line) that it’s not as bad as the “alarmist” have made it out to be. It’s better than 2oo7 (purple line) and 2008 (green line) and actually seems to be on course, so far, with 2009 (blue line). Please note that 2009 was better (more ice) than 2007, which is the year the “warmers” tout as proof we’re melting like the Wicked Witch of the North in the Wizard of Oz. 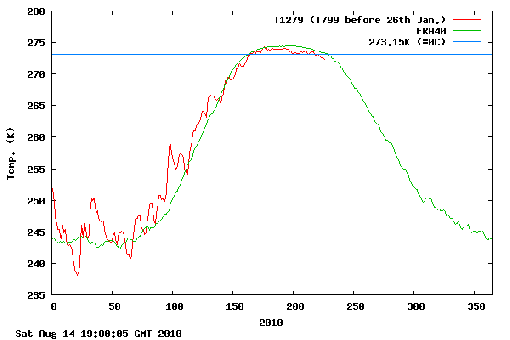 You’ll see there is one small period where 2010 drops slightly below 2007, which has also been flying around the MSM as proof that the ice is melting. The only problem is this only lasted a matter of days before it changed back. Notice you didn’t hear anything about that in the MSM, did you? They don’t want you to know that it was only a blip on the radar. They’ll take any tidbit they can find and use it to preach global warming. You should check out Watts Up with that here as they have more charts and explanations about what’s happening in the Arctic and the Antarctic. By the way the Antarctic isn’t melting away either. You can plainly see per the below chart that 2010 (red line) is probably going to set a record as the sea-ice extent is significantly higher than 2003, 2004, 2005, 2006, 2007, 2008 and even 2009. Something else you don’t hear from the MSM. Don’t believe me? Here’s a quote attributed to Dr. James Hansen, Director of the Goddard Institute for Space Studies (GISS). The 12-month running mean global temperature in the GISS analysis has reached a new record in 2010. The main factor is our estimated temperature change for the Arctic region. Hell, who needs reality? Let’s just estimate what we want the public to hear! Will this type of CO Insanity ever go away? I”m not holding my breath.